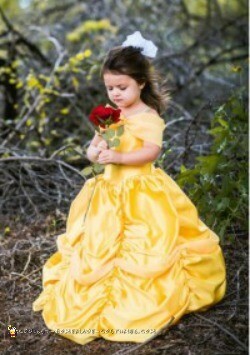 My favorite princess growing up was Belle! My daughter is now joining me in the love for Beauty and the Beast. I love sewing so I had to make sure I knew what she wanted to be for Halloween before it was October 31st. She had decided in July she wanted to be the yellow Belle. So the research began. Well, I probably spent way too much time on Etsy and Pinterest looking for ideas. 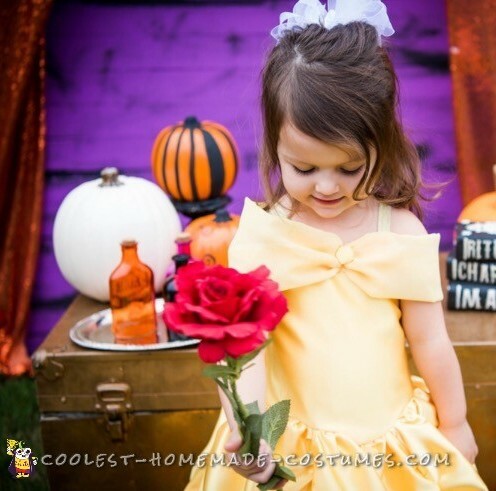 I ended up deciding to do a traditional dress for her toddler Disney Halloween costume. I wanted her to look like she fell right out of the cartoon. 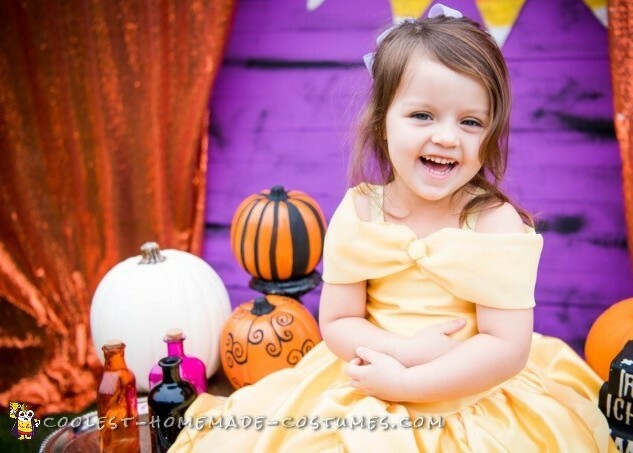 She had Halloween pictures on September 28th and because I’m not a procrastinator I wanted to make sure I gave myself a few weeks to work on her dress in case there were problems along the way. So I began working on it September 23rd which it turns out I am a procrastinator because I still had to make a beast costume. Okay, on to the sewing. 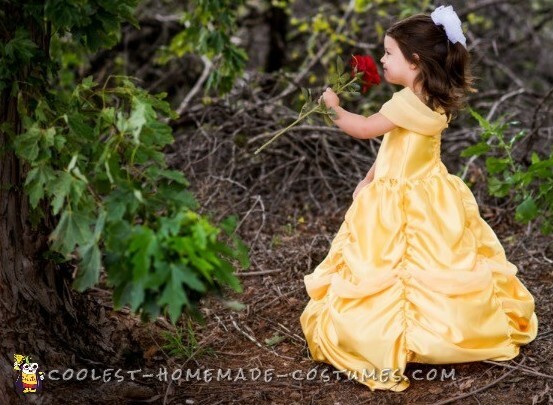 I used a dress pattern that I already had that has a sweetheart neckline which is what Belle’s has. The pattern I used for the bodice is the Beloved by FooFoo Threads. The bodice was easy I just followed along with the pattern instructions. The skirt was stressing me out because I didn’t want to mess it up. I live about 2 hours away from the fabric store so just grabbing more isn’t easy. I decided to just buy a pattern so I used Nancy by Create Kids Couture. It made it way less stressful. I gathered the skirt as pattern instructed and it ended up being like 10 inches too long so I started snipping away. For the sash across the shoulders, I measured around her and added a few inches. I took a long strip of chiffon and folded in half long ways and sewed it so it was like a long tube. I found the middle and the attached it to the center of the bodice. Then, I overlapped the ends and stitched it to the back. It ended up being too tight around her so I had to take it apart and add fabric to it. Finally, for the bottom part that sways across the skirt.. I don’t really know what that’s called. But I had her stand on the table wearing her dress and I pinned it and moved it around until I liked it and stitched it down. On the top I used a fabric covered button but I couldn’t get my fabric to stay so I glued the fabric on to it. I thought the dress would stay up without having straps but it didn’t so I used gold elastic and stitched it onto the bodice front and back so it wouldn’t fall down. After my toddler Disney Halloween costume was all finished, it looked so heavy. And then I realized she needed a hoop skirt. I found a cheap one on Amazon and it definitely made the dress have the extra oomph it needed. 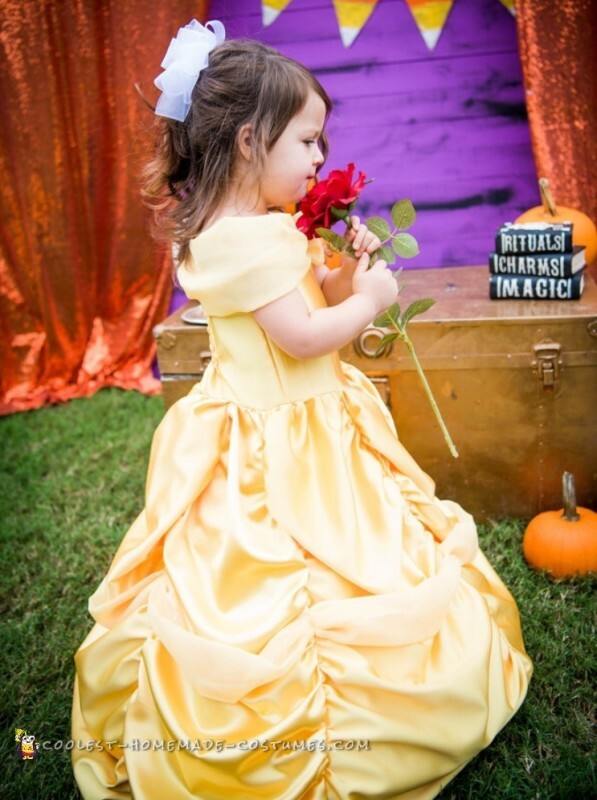 She will be the Belle of the ball or at least of Halloween.